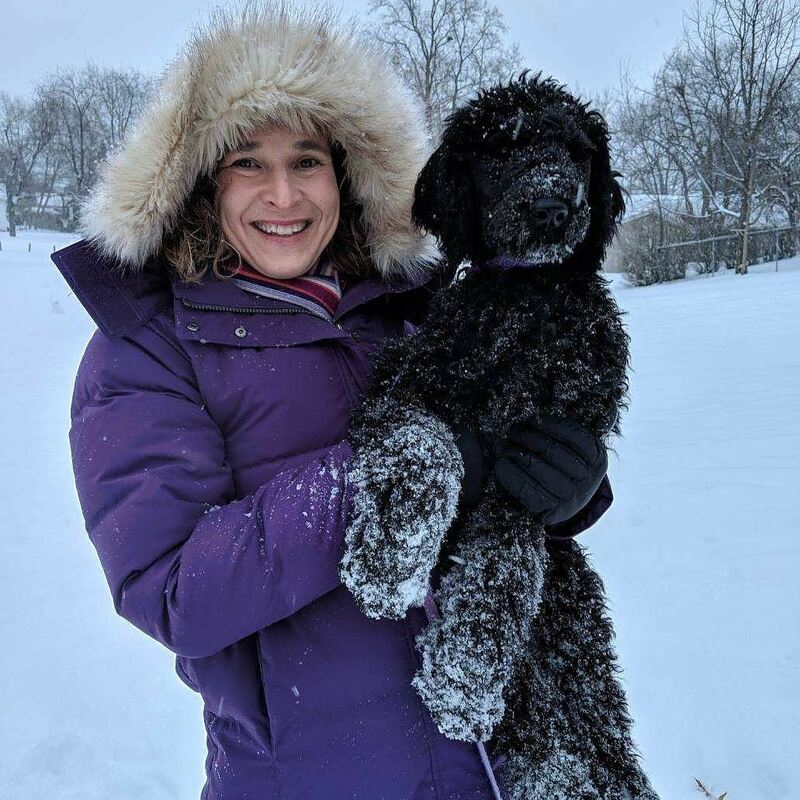 On this installment of "Meet an IAYB Leader", we meet our Board Vice Chair Jennifer Owens. Thanks for your leadership Jennifer! What sparked your interest in birds/nature? Growing up, my family was always interested in nature and the outdoors. We did a lot of camping and picnics. My interest in birding started with my grandmother who passed it along to my mother and then to me and now to my children. My grandmother kept a backyard bird list of numbers/types of birds seen at her backyard feeder for every month of every year for much of her adult life. When she died, my mom and her siblings found boxes of the little notebooks she used for this. That is a tough one- so many to choose from! One of my favorites would have to be the Rose-breasted Grosbeak because it reminds me of my childhood- we usually saw them at our favorite camping park. I’m also fond of Great Horned Owls as I worked in a small raptor rehab facility as an undergraduate and used live owls to do educational programming for local schools. What is your favorite birding/outdoor space? I like to bird anywhere and everywhere! One of my go-to favorites is Brookside Park in Ames. Do you have young birders in your family? Both of my “young” birders are now young adults. While both of my kids enjoy birding, my daughter (who recently graduated from college) does so only casually. My son William is a graduated Iowa Young Birder and is a very active birder. William is currently a Biology and Math major at Iowa State. How did you first learn about Iowa Young Birders? I can’t remember how I heard of the opportunity, but I signed William up for an Iowa Young Birder event at Iowa State University when he was in middle school. The Ames Tribune ended up interviewing William before the event and writing a really nice article about him! After the Iowa State event (which I think featured Steve Dinsmore), I officially signed William up for IAYB and I believe our first official trip was to Ledges State Park. What has been your favorite IAYB trip thus far? Tough call. I would say I really enjoyed seeing Prairie Chickens in southern Iowa but both William and I enjoyed the Hawk watch trip to western Iowa a lot. What motivated you to become an IAYB Board Member? I have always tried to be involved in things my kids love. As William’s passion for birding developed, it was a natural step for me to be involved. As William aged out of the organization I have continued to be involved with the board. While my contribution in the last two years, has mainly been limited to board meetings, I enjoy helping the organization move forward. Why do you feel exposing young people to birds and nature is important? I truly believe this generation of young people will be responsible for saving the Earth as we know it. Discovering the beauty and wonder of nature is an important step to being willing to fight to preserve it. Birding is one of the most rewarding, yet simple way to enjoy nature. Birds are everywhere, from city rooftops to country fence lines. All you need is a pair of binoculars and your curiosity. 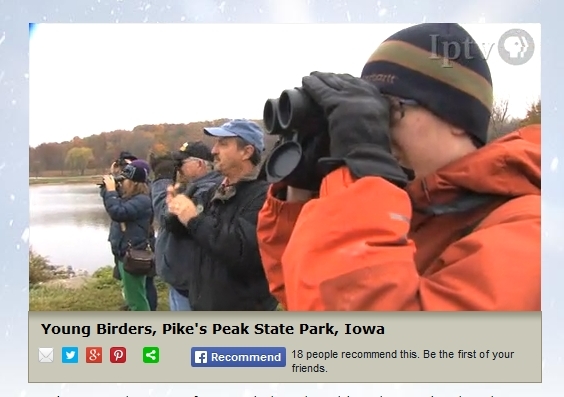 I love to help people discover how easy it is to watch birds and how amazing they are when you watch! Cameras in hands and binoculars around necks, 5 young birders and their parents gathered on a brisk and breezy morning at Walnut Woods State Park for our Spring Birding and Photography Workshop. Our guest presenter was graduated young birder William Crow, now a student in Biology and Mathematics at Iowa State University and a talented nature photographer. William started our morning by presenting some tips and techniques for photographing nature and birds, including how to set up your camera and how to set up your shot. William shared with us the importance of lighting and composition and provided tips and tricks to be effective in both these areas, including using natural light to your advantage, positioning the subject of your photo in the frame using the rule of thirds, and altering the appearance of your subject using different shooting angles. These were all great tips that we were excited to master, so we set off on a photography scavenger hunt to practice our newly-acquired skills. Cameras were hard at work during the scavenger hunt, snapping photos of leaves on the ground, mushrooms on a log, picnic tables, and even an acorn stuck in bark crevice on the trunk of a tree. One thing is certain, observation skills are just as important for finding a great photo as they are for finding birds! Once back together as a group, we took advantage of a cooperative American Robin for practicing our skills a bit more and tried to snap a few photos of a nearby Eastern Bluebird pair that was investigating one of the local bluebird houses. We then went to the bird blind to practice more on moving targets. The feeders were very active with Downy, Hairy, and Red-bellied Woodpeckers, Black-capped Chickadees and White-breasted Nuthatches as well as Red-winged Blackbirds and Common Grackles. Dark-eyed Juncos and White-throated Sparrows occasionally appeared on the ground under the feeders as did Northern Cardinals. We were even treated with glimpses of a Fox Sparrow scratching about in the cover behind the feeders, a first of the season for many. We took a lot of photos in just 20 minutes! After a quick warm up in the cars, we stopped at some wooded ponds near the east entrance of the park with hopes of viewing and photographing waterfowl using a technique called digiscoping, which involves taking photographs through your optics (usually a spotting scope, but digiscoping can also be accomplished through binoculars). We were lucky to find a nice flock of ducks composed of Blue-winged Teal, Mallards, Ring-necked Ducks, and Bufflehead, as well as Wood Ducks, Canada Geese, and a pair of Hooded Mergansers. While shooting some photos through our spotting scope, we observed an Eastern Phoebe foraging from tree to tree around the pond and heard a Song Sparrow singing nearby. Young birders not only learned several photography tips and techniques on this fun morning, but also how patience and careful observation will make you both a successful photographer and birder. Many thanks to William Crow for sharing his expertise and to Phone Skope Birding for sharing one of their fantastic adapters with us to practice our digiscoping skills. You can view photos from our morning here and our bird list here. 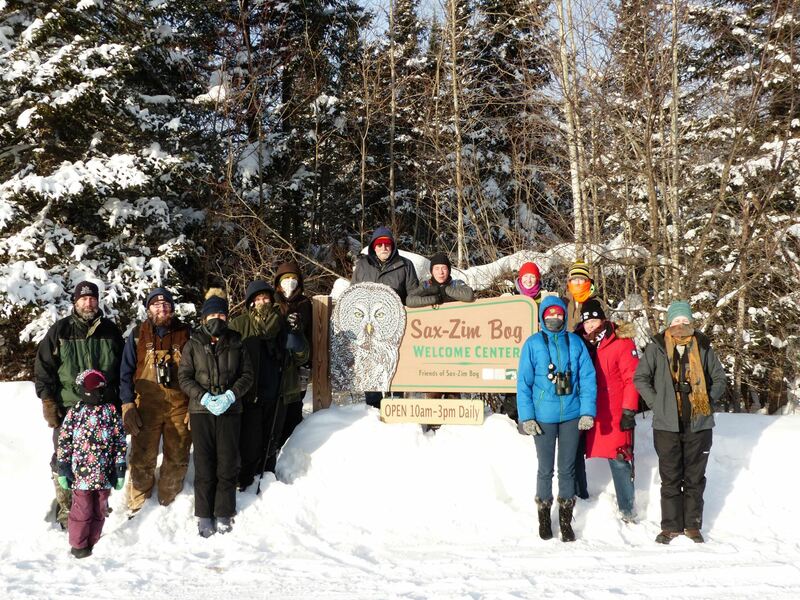 On February 8, 2019, 13 young birders and their families met Executive Director Tyler Harms and volunteer leader Kevin Murphy for a weekend of winter birding in Duluth, Minnesota for our Northern Minnesota Weekend 2019. The plan was to visit Sax-Zim Bog, a world-famous winter birding location where one could delight in several boreal bird species including both Great Gray and Northern Hawk Owls, birds for which the area is known, as well as others like Boreal Chickadee, both Evening and Pine Grosbeak, and Canada Jay. Despite a somewhat stressful and treacherous drive for all on Friday the 8th, spirits were still high and excitement was in the air when we met briefly Friday evening to welcome everyone and discuss logistics. We also started our trip list with a Common Raven that was seen earlier that afternoon by one of the young birders in the hotel parking lot. Then, it was off to prepare for an early morning with boreal birds on our minds! After a quick breakfast on Saturday morning, we loaded our van, which was to be later named the “Snowy Owl” (I’ll let you guess the color), by 6:00 AM in order to arrive at Sax-Zim Bog before sunrise to search for Great Gray Owls. By the time we reached the Bog, the Snowy Owl was recording an ambient temperature of -26° F! Still somewhat sleepy from the early morning, we were quickly awakened by the sight of a large owl flying across the road upon entering the Bog. We scanned the treeline in the twilight with hopes high of locating our #1 target bird (Great Gray Owl) in the first 10 minutes of the trip, but it was a Great Horned Owl that elevated our hopes. Still a fun bird to see! Because of the extremely cold temperatures, much of the birding is done from the comfort of a heated vehicle. Therefore, we continued to search for owls along both McDavitt and Admiral Roads, two areas known to be frequented by Northern Hawk and Great Gray Owls. With no owl luck by sunrise, we stopped briefly at the Admiral Road bird feeders. Pine Grosbeaks and Common Redpolls were numerous at this location, both of which were life birds for many, along with some Black-capped Chickadees, Pine Siskins, and the occasional Downy and Hairy Woodpeckers and Red-breasted Nuthatch. This is also a known location for Boreal Chickadee and, while some had fleeting glimpses of a single individual, not all were able to see the chestnut-colored relative of our common Black-capped. We planned to stop by later. After the feeders, we headed towards an area known for lekking Sharp-tailed Grouse. We searched this area for some time with no luck, so we continued to the Friends of Sax-Zim Bog Visitor’s Center for more feeder watching. Pine Grosbeaks were again numerous at this location, and all enjoyed close looks of this species along with more Common Redpolls, Black-capped Chickadees, and others. We also saw what was believed to be a Common Raven in the distance and added Red Squirrel to our mammal list. Back in the Snowy Owl, we then headed to the northwest corner of the Bog for a visit to Mary Lou’s feeders. It was here that we saw our first Evening Grosbeaks of the trip, another life bird for all. The vibrant colors of these birds made it worth standing for several minutes in the cold watching them come and go from the feeders. While there, we also heard and saw more Common Ravens in the distance. We then decided to look once more for Sharp-tailed Grouse and check for an actual Snow Owl (not our van) at a location on the south end of the Bog before lunch. Though we did not see either of these birds, we did stop en route to put the spotting scopes on two Canada Jays foraging along the roadway. Another target bird checked off the list, we headed for the Wilbert Café in the Cotton, Minnesota for a delicious lunch and time to warm up. Little did we know things were about to get very exciting that afternoon! Near the end of our lunch, Kevin received information that a Northern Hawk Owl was just located in the Bog. We quickly loaded the Snowy Owl and headed for the location. We arrived, donned are warmest clothing, and started out for a hike on a narrow snow trail into the Bog in search of our #2 target bird. After hiking for about a half mile, we joined several other birders and photographers to view a gorgeous Northern Hawk Owl perched high a spruce tree. It was very cooperative, and all were able to get great views of the bird through the spotting scopes. Excited from seeing one of our top target birds, we hiked back to the Snowy Owl to continue our afternoon. We received a tip from some fellow birders that a Great Gray Owl was seen not 10 to 15 minutes earlier just around the corner from where we were currently standing. We decided to become a bit more methodical in our search for Great Grays, so we carefully scanned the aspen and spruce trees along Admiral Road and turned down Kolu Road, an area where Great Grays hadn’t been seen yet but the habitat looked appropriate. As we slowly drove down Kolu Road, we were rewarded for our patience. About 15 yards off the road, we located a Great Gray Owl hunting in an aspen stand! All were plastered to the windows, staring in awe at this majestic bird. What an amazing experience to see the tallest of the North American owls! After the Great Gray, we quickly headed for the Friends of Sax-Zim Bog Visitor’s Center where we were treated to a fantastic program from Lead Naturalist Clinton about the history of the Bog and its many plants and animals. A huge thanks to Clinton for taking time to speak with us! Based on a tip from Clinton, we left the Visitor’s Center for the Warren Nelson Memorial Bog to look for the elusive Black-backed Woodpecker. The scenery was spectacular as we quietly walked along the boardwalk listening intently for tapping among the many black spruce trees. We hiked to the end of the boardwalk, seeing Downy and Hairy Woodpeckers and Black-capped Chickadees along the way. We stood, dead quiet, at the end of the boardwalk for five or more minutes. Listening and watching intently, we finally saw a woodpecker fly overhead and land in a nearby spruce. There it was! A Black-backed Woodpecker was working up the tree before it flew away briefly only to land directly in front of us at the base of a tree, providing better looks than any of us could ask for! We left the Bog to return to Duluth, but not without adding both Wild Turkey and Ruffed Grouse to our bird list and a quick stop to see a Porcupine high in a tree! On Sunday morning, we headed back to the Bog to look for Sharp-tailed Grouse and Boreal Chickadee in order to complete our target list for the weekend. We went directly to the Racek Road feeders, a known feeding location for grouse, to wait and watch. We did so for about 30 minutes with no luck, so we decided to head to Admiral Road for the Boreal Chickadee. On the way there, we stopped to look at a Canada Jay and had brief looks at a Northern Shrike. Good thing we stopped, because it was then that Sharp-tailed Grouse were reported at the Racek Road feeders. We had just missed them! We headed back to the feeders along with several other birders (testament to how challenging these birds are to see in the Bog). We joined several others to see three grouse picking below the feeders. Only one target bird left! We headed back towards Admiral Road for the Boreal Chickadee. Not long after turning onto the road, a large raptorial bird flushed and flew across our path. We quickly put binoculars on the bird – a Northern Goshawk! The bird continued flying and landed in a distant tree, allowing us time to put the spotting scopes up and study the bird to confirm the identification. We then continued to the Admiral Road feeders and waited only a couple minutes for a Boreal Chickadee to show up on the peanut butter feeder. Our target list was complete! We headed back to Duluth, extremely pleased with the great end to a fun weekend. This trip would not have been possible without the assistance of volunteer leader Kevin Murphy. Thanks also to the young birders and their families for braving the wintery weather and driving conditions to join us for a bird-filled fun weekend! You can view photos from our weekend here. Iowa Young Birders is grateful for the leadership of our Board Members, and we want you to meet them! In the coming months, we'll interview each of these amazing folks to learn more about them and their interests! Up first - Board Chair Kathy Solko-Manternach. While growing up in Mankato, Minnesota, I often went traipsing through the woods with my dad as he hunted or just to take a walk. I was also lucky enough to spend long hours on various Minnesota lakes while growing up. We took family vacations to northern Minnesota and I was Dad’s early-morning fishing partner. I remember seeing my first eagle on one of those lakes. The north woods were the perfect venue to fall in love with the out of doors and the birds that surrounded us. In addition, Dad was an avid backyard birder and I was his partner in keeping the feeders clean and filled. Even after I left for college the various seeds and suet would be waiting so that dad and I could spend time feeding the birds and catching up. I helped him shovel through many a large snow drift to replenish the feeders. My favorite bird is the Common Loon. I love the wailing call, the stark black and white coloring and their antics as they dive. I suppose that is why my favorite birding and outdoor space is near or on the water, whether that be a lake, the ocean or a river. Grandson Ravi (13 years old), granddaughters Indira (5 years old) and Anjali (3 years old). How did you first learn about Iowa Young Birders and do you remember your first IAYB field trip? I first learned of IAYB through our daughter who suggested this might be a fun activity to take our grandson to. Steve and I ended up getting grandson, Ravi a membership for Christmas when he was 9 years old and we went on our first birding adventure with him in January. Even though we were on the banks of the Mississippi in a snowstorm, we had a great time counting eagles and identifying gulls. That first trip was the start of many IAYB adventures with our grandson who is now 13. It is difficult pick a favorite IAYB outing because each has its own special highlights and memories. Ravi helped me spot a Burrowing Owl through a scope in the grasslands of Colorado. Funny how I thought that little owl was a lump of dirt (insert eye roll from grandson)! We all loved the cacophony of sound as the Tundra Swans gathered near Harpers Ferry. We could barely see them through the snow but we could certainly hear them. There has been many an Iowa park that we would not have visited if not for our IAYB adventures. 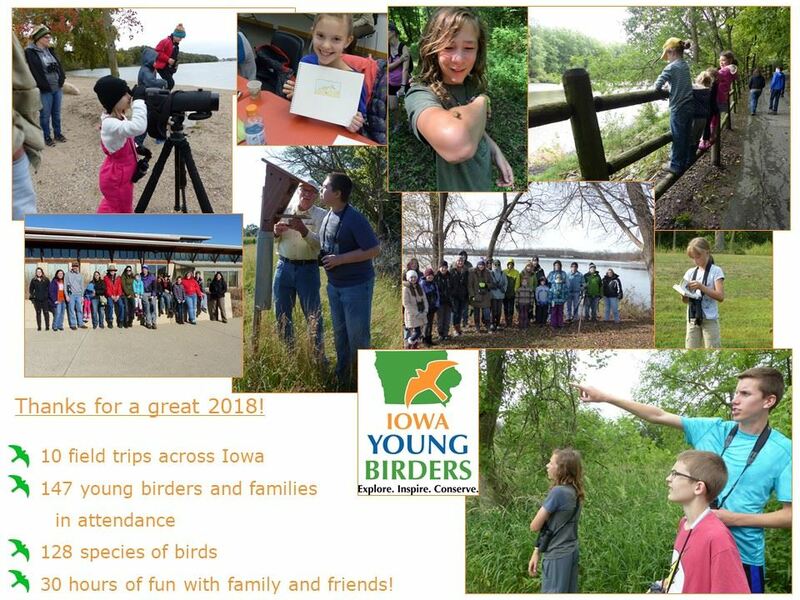 With several years of involvement in IAYB it became important to me to support the Iowa Young Birders Program whether that is through being a board member or through monetary donations. Any organization needs active member involvement to remain viable. IAYB is a program that gets kids and families outside together; meeting other kids and families while having a fun learning experience. Kids can not only learn about birds through sight and sound but we all learn about habitat and conservation as we wander over Iowa’s beautiful country side. Why do you feel exposing kids to birds and nature is important? I believe that respect for nature is a life lesson that IAYB members begin learning at an early age. Respect for nature; respect for others in the group are life lessons that IAYB members will carry throughout their life. Light rain and a brisk wind didn’t stop 15 young birders, parents, grandparents, and volunteers from setting out on a search for migrating wetland birds in northwest Iowa on October 6. And it certainly didn’t stop the birds either, because we ended the morning with more than 40 species! What better way to start a birding trip? With delicious donuts of course! Many thanks to Kaitlin Anderson and Mary Barrick with Palo Alto County Conservation Board for hosting us and providing a pre-birding snack for all attendees. After our treats, we left the Lost Island Nature Center en route to the first wetland but were immediately distracted by bird activity. Several Ruby-crowned Kinglets and Yellow-rumped Warblers were flitting about in the trees, and volunteer leaders Lee Schoenewe and Joe Jungers quickly spotted a Red-breasted Nuthatch in a nearby tree. As we worked to position ourselves for some great looks at the Red-breasted Nuthatches (yes, another appeared a short time later), we also noticed a couple Brown Creepers in the area. In the distance, we heard White-throated Sparrows calling and later were able to see one at close range. Both Orange-crowned and Palm Warblers made a quick appearance, and a cooperative Yellow-bellied Sapsucker was spotted high in nearby tree. Yes, we were supposed to be searching wetlands, but who could pass up these great birds? Our first wetland stop was in Lost Island State Park near the beach, where 29 Great Egrets, 2 Great Blue Herons, and a single Belted Kingfisher were seeking refuge from the brisk wind. It was a quite a sight to see so many egrets in one small spot! We continued to Lost Island Lake Marsh where our hope was to locate both Le Conte’s and Nelson’s Sparrows. Hiking through the grass near the wetland, it didn’t take us long to flush a small, pale sparrow flying low and quickly diving into the grass. It was a Le Conte’s Sparrow, but unfortunately the wind discouraged this bird from remaining visible for all to see. However, we also flushed a Song Sparrow on the walk which allowed us to note the drastic differences in size, color, and flight behavior of the two species. Near the end of our walk, we heard Sandhill Cranes calling in the distance and were able to locate them in flight a short time later. We finished at this location with great looks at a couple Harris’s Sparrows and a young Northern Harrier hunting in the distance. We made a couple quick stops at other wetlands to continue our search for the elusive Le Conte’s and Nelson’s Sparrows. Although we were unsuccessful in our search, we were not disappointed as young birders were able to see Blue-winged Teal and Pied-billed Grebe through the scope and a kettle of Turkey Vultures high above, obviously successful in their search for warm, rising air. By this time in the morning, we were all wishing they would share some warm air with us! Twenty-one young birders, parents, grandparents, and volunteers kicked off the fall birding season with an exciting morning of birding at Red Rock Reservoir on September 8, 2018. Our target bird list included everything from Ruby-throated Hummingbird to Pileated Woodpecker. When you start the morning off seeing warblers from the parking lot, it’s hard not to be excited! We spent the morning below the main reservoir at both Ivan’s and South Tailwater Recreation Areas. Immediately from the parking lot at Ivan’s, we spotted a couple American Redstarts in a nearby tree hyperactively looking for insects. We quickly checked one species off our target list by spotting a Ruby-throated Hummingbird at a feeder in the campground. We slowly moved toward the river, carefully watching the treetops and enjoying the extremely pleasant fall weather. Once at the river, we noticed both Caspian Terns and Ring-billed Gulls foraging over the water as well as a large, mixed flock of migrating swallows overhead. We walked farther along the river and stopped to carefully examine an adult male Mallard in non-breeding plumage, making a list of characteristics that help us identify the bird such as the dull yellow bill, overall brown color, and purple speculum on the wing. The occasional Bald Eagle and Turkey Vulture cruised overhead, and several flocks of American White Pelicans were seen taking advantage of breeze throughout the morning. Next, we started down the paved trail between Ivan’s and South Tailwater Recreation Areas. Although the birds were quiet initially, we enjoyed capturing and examining a Cricket Frog and watching what we all felt was the largest Snapping Turtle in Iowa crawl through the mud in a nearby off-channel wetland. A Great Blue Heron posed nicely in the water for us allowing young birders long, close looks through the spotting scope. As we continued along the trail, we were greeted by White-breasted Nuthatches, a Warbling Vireo, and Red-bellied Woodpecker. We were drawn off the trail for a bit to explore a nearby shale deposit with a stream running through it. What an interesting geological feature! Once back on the trail, we found a little hotspot of bird activity in which we saw a Black-and-White, Magnolia, and Golden-winged Warbler while a Carolina Wren and Yellow-throated Vireo sang to us from nearby. We turned back towards the parking lot and, on the return trip, added Ovenbird, Swainson’s Thrush, and Red-eyed Vireo to our species list among others. A cooperative Belted Kingfisher perched on a limb near the wetland was an exciting bird for young birders. Back at the parking lot, the bird activity was even hotter than earlier and young birders spotted several Chestnut-sided Warblers, a Bay-breasted Warbler, and another Black-and-White Warbler low in the brush. What a great finish to the morning! This trip could not be possible without the assistance of Marla Mertz with Marion County Conservation Board. We’re grateful to volunteers from the Red Rock Lake Association for their leadership on the trip and for providing snacks. And as always, many thanks to our young birders and families for attending! You can view photos of our trip here and our species list here. On August 18, 2018, eleven young birders, parents, grandparents, and volunteers met at Memorial Park in Ottumwa for a morning of birding in southern Iowa. The morning started off cool and overcast but quickly warmed up when the sun appeared. Lucky for us, the birds were hot all morning! Our target bird at Memorial Park was the Mississippi Kite, a unique Iowa bird. Memorial Park is one of two regular nesting locations for this species in Iowa, and the nesting pair had returned for another southern Iowa summer. It didn’t take long for us to find the small family as one of the adults was perched in the top of a White Pine tree near the parking lot as young birders arrived! However, this was only the beginning of what continued to be an amazing spectacle as both adults actively hunted overhead, showing off their talent in aerial acrobatics. The two juvenile birds were also present, continuously calling to remind their parents of their hunger and expected receipt of any captures. After an hour of watching in awe, we decided it best to leave for our second destination despite the desire to watch these birds even longer. This was a life bird for all young birders present, and for the parents and grandparents as well! Next, we traveled south of Ottumwa to Pioneer Ridge Nature Area. Owned and managed by Wapello County Conservation Board, Pioneer Ridge contains a variety of habitats that makes birding this location very exciting. Although the temperature was rising quickly, the birds were still quite active and we were immediately greeted by Gray Catbirds and American Goldfinches. Several Ruby-throated Hummingbirds were also putting on a great show, chasing each other along the edges of a nearby pond. We stopped along the trail to examine a Baltimore Oriole nest and spotted two young Great Crested Flycatchers in the distance. Later on our hike, we took a break in a nearby barn shelter to search for bats in the rafters (beneath the piles of guano) and enjoyed close-up views of a Black Swallowtail butterfly captured by one of our young birders! We finished our hike at a nearby pond. A pair of Belted Kingfishers were hunting and chattering nearby as the young birders accumulated quite the collection of snail shells from the water. A great place to finish a great morning! I’m grateful to all who attended to make this morning a ton of fun and to Kornelia Robertson for sharing some great photos from our trip. You can view photos from our trip here as well as a species list from Memorial Park here and Pioneer Ridge Nature Area here.